It’s pretty hard to break too much new ground in describing the often-praised burgers at this roadside throwback so I won’t even try. I’ll just let the picture speak for itself and direct you to some great reviews elsewhere (NYT – Hamburger Heaven), including the listing that originally piqued my interest over at Roadfood.com. 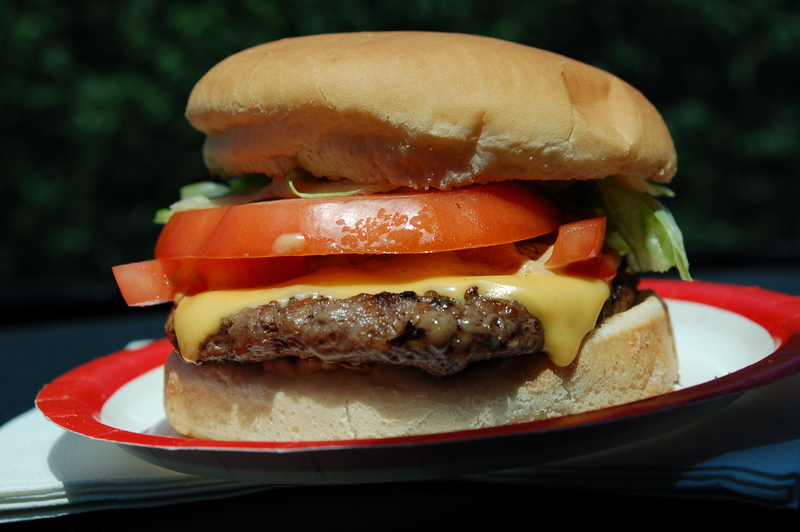 What I can add is this – I have never had a fast food-style cheeseburger with as much flavor as this one. It seems incongruous because there doesn’t appear to be much to this equation. Just a 1/4 lb(ish) hand-formed beef patty cooked up fresh right before your eyes then crowned with perfectly melted yellow American cheese and a cadre of exceedingly fresh toppings all wrapped up in a squishy white bun. Nope, no magic there, but somewhere along the way this burger picks up a depth of flavor that blew me away. In an era of ever-increasingly complex burgers, it takes a basic set-up like Red Rooster’s to remind me what it is I truly enjoy about burgers – the powerful taste of simple, fresh ingredients. No secret sauce, no proprietary blends, no artisan baked rolls, no celebrity chef, no trendy decor…nada. Just pure happiness on a paper plate. If you are heading upstate out of New York City (perhaps on your way to Joe Beez in Kingston) look for this candy-striped A-framed hut, it is truly a worthwhile stop. Grab one of their stellar milkshakes and if you have time, fit in a game of mini-golf and then rue the fact that when your parents were kids places like the Red Rooster were a dime a dozen.